Clancco » Art Law » Can Orangutans Own Intellectual Property? Can Orangutans Own Intellectual Property? 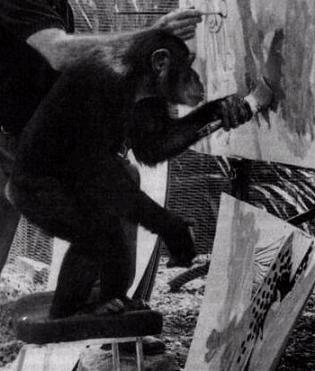 We couldn’t help but wonder: Who owns the copyright to the orangutan’s painting? We think there are a four options (with the first being the winner). One, the orangutan owns the copyright, primarily because copyright law grants protection to the “author,” and doesn’t mention “person,” “human being,” or upright primate sans tail. Two, if the orangutan is found to be an employee of the zoo, then the zoo owns the copyright. Think about it, in this day and age the monkey could be found to be a performer who received compensation and workman’s comp for his dangerous duties. Three, if the zoo and/or the zoo’s animal trainer aided the orangutan, then either the zoo or the trainer are joint authors with the orangutan, giving them both 100% copyright ownership (although more likely than not the zoo would own it here because the trainer aided the monkey as part of his employment duties); and four, we can certainly see a judge (perhaps one from Massachusetts), finding that the orangutan is an infant, and thus has full copyright ownership over his painting, but any business dealings will most likely be regulated by state laws (and thus directed and approved by the monkey’s caretakers and a state judge). For those of you thinking work-for-hire, good try but it doesn’t hold much water (at least in most states, but we can’t vouch for Massachusetts) because there wasn’t a written contract stipulating as such, and more importantly, because portraits are not covered by work-for-hire laws. So, there you have it. The next legal case the U.S. Supreme Court will hear is whether or not the primate can license his copyrights, and to make matters a bit more interesting for Justice Scalia and Thomas will be weather or not the Visual Artist’s Rights Act (VARA) applies to orangutans, and whether or not the zoo can exhibit the orangutan’s paintings without her consent. Stay tuned! This entry was posted on Tuesday, April 15th, 2008 at 8:44 pm	and is filed under Editorials. You can follow any responses to this entry through the RSS 2.0 feed. You can leave a response, or trackback from your own site.